Greetings once again in the precious Name of our Lord Jesus Christ. 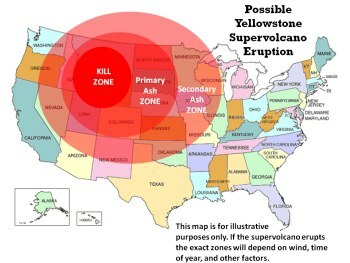 Earth's birth pains are increasing with tectonic activity in Japan, Russia and Yellowstone, USA. There is a link to a real-time earthquake monitor on our front page. You may assist in disseminating the present Truthwhat Jesus is doing now, by sending copies of our Newsletter with a note inviting on-line subscription from serious seekers of Truth. CDs of the Church Website contain about 600MB of Christian resources and may be ordered by clicking the link at the bottom of this page. September 14, 2003  First report: "Hello folks, my next door neighbor just got back from a week's stay in Yellowstone. We talked and I was told that a lot more camping areas have been closed off besides around the Lake. He is an avid fisherman, said the fish are floating dead in the streams, and the lake is closed. A very strong smell of H2SO4 (sulfur). People were leaving due to smell". Jerusalem Post says: "Kill Arafat"
Following WWII Jews from around the world poured into Palestine. Jewish terrorists, and the many Jews who flooded into Palestine, perceived themselves as the new lords of the lands. They bombed and terrorized the indigenous people from their own soil. They killed women and children, and many of those who did not voluntarily hand over the old, established and legally owned land to the intruders. "The Jews had no right to expropriate a single acre of Palestinian land. . . Yet their new state was necessarily founded on dispossession" (The Independent, London, December 3, 2001, p. 15). Günter Grass, Nobel-Prize laureate, stated: "Israel must not only get out of occupied territories. Even the seizure of Palestinian land is a criminal act. This must not only stop, it must be revoked" (Hellweger Anzeiger, October 22, 2001). Jürgen W. Möllemann, former German Minister and deputy leader of the Liberal Democrats (FDP) said shortly before he was killed: "When a state makes up an execution list without a proper court hearing, that's state terrorism. So I am sticking to my claim." (During a phone interview with DPA from Riyadh, Saudi Arabia, Irna, October 10, 2001). Jürgen W. Möllemann, a parachutist, died on June 5, 2003, supposedly committing suicide by jumping to his death. Mossad earlier "wanted his political head" (Stern, March 10, 2003) for referring to Israel as a terrorist state. The Jerusalem Post, the voice of the Israeli Government, bluntly calls on Israel to "kill Arafat," the democratically elected leader of the Palestinian people: "The world will not help us; we must help ourselves. We must kill as many of the Hamas and Islamic Jihad leaders as possible, as quickly as possible, while minimizing collateral damage, but not letting that damage stop us. And we must kill Yasser Arafat, because the world leaves us no alternative" (IsraelNationalNews.comSeptember 11, 2003). 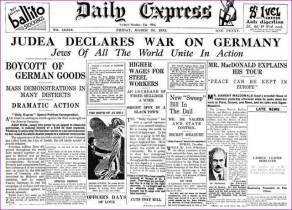 It reminds us of 1933 when, for the first time, Jewry declared war on Germany and called on the world to kill Adolf Hitler: "Judea declares War on Germany" (Daily Express, London, March 24, 1933, front page). The Jewish declaration of war on Germany was pronounced 19 days after Adolf Hitler won absolutely democratically the general election and only one day after he was even more democratically empowered by the "Reichstag" (parliament) to resolve the dire straits and poverty in Germany. Of course, no concentration camps were built and no restrictive Laws regarding the Jews had yet been passed at that time. Later the World Jewish Congress and the Zionist leaders succeeded, according to the Torah True Jews, to initiate World War II: "The worldwide boycott against Germany in 1933 and the later all-out declaration of war against Germany, initiated by the Zionist leaders and the World Jewish Congress . . ." (Rabbi Schwartz of the American Neturei Karta Movement, Friends of Jerusalem, stated in the New York Times, September 30, 1997). Comment: According to former Israeli Prime Minister Yitzhak Rabin, senior Israeli military officers, US Ambassador to Israel Daniel Kurtzer, US intelligence and former State Department officials, "beginning in the late 1970s, Tel Aviv gave direct and indirect financial aid and training to Hamas over a period of years". Anti-Christian forces led by a wide-ranging group of high-ranking Israeli officials won a major victory on March 30. Representatives of 50 different international Christian evangelical groups entered into what was described as an "unprecedented" joint statement promising not to carry out Christian missionary work in Israel. R. James Woolsey, a former Director of Central Intelligence, calls the war on terror "World War IV" and said recently that "we will be in this war for many years, quite probably for decades." Woolsey told the Royal Institute of International Affairs that three movements, all Islamic, are "essentially at war with the West, with modernity, with western Europe and the United States and our allies." The enemies, Woolsey said, are "the fascist" and "anti-Semitic" regimes of Syria, Libya, and Iraq, "the mullahs in Tehran," and "Al Qaeda and its supporters" . . .
By 2010 the Muslim world will control as much as 60 percent of the world's oil production and 95 percent of remaining global oil export capacity, according to Britain's former environment minister, Michael Meacher. The "global war on terrorism," Meacher says, "has the hallmarks of a political myth propagated to pave the way for a wholly different agendathe US goal of world hegemony, built around securing by force command over the oil supplies required to drive the whole project" . . . The Anglo-American invasion and occupation of Iraq is counter-productive, according to Sen. Robert C. Byrd (D-WV): "Our military action in Iraq has forged a cauldron of contempt for America, a dangerous brew that may poison the efforts of peace throughout the Middle East and result in the rapid invigoration of worldwide terrorism," Byrd wrote in the Washington Post on August 26 . . . If officials of the Bush administration were complicit in the attacks, as Davis and Meacher suggest, there would have to be a secret network that connects the planners at the highest levels of government. There are a few secret organizations to which key high-level government officials belong, for example, the Council on Foreign Relations and The Order of Skull and Bones of Yale University. President George H.W. Bush is a member of both. Among fellow "Bonesmen" the elder Bush is known as "Magog." Comment: Significant new aggressive United States provocations materialized last week in Venezuela and the Philippines to go with the ongoing covert operations against Syria, Iran, Saudi Arabia, Colombia, North Korea, Cuba, Libya, Sudan and various other struggling states in Africa, South America and Asia. In addition the US has long since deployed troops and weaponry in fledgling statelets bordering the south side of Russia to intimidate that floundering superstate, and continues to flirt with a war against China over the tense issue of Taiwan. Only in Western Europe and North America does the US have nominally good relations with anyone it doesn't regularly bribe, and even in that sphere, Canada, France, and Germany are realizing the new American-Israeli police state axis could turn on them at any time. Everyone in the world with half a brain now realizes that the genuine axis of evil is the United States, Britain and Israel, with a few pseudo-Islamic sycophants such as Egypt, Saudi Arabia and Pakistan and wild-card sellouts like India and Australia hanging onto the coattails of the tyrannical triad, not realizing the treacherous fate that awaits them too (John Kaminski, Enemies of Everyone). John Shovelan: The Pew Research Centre has published polls illustrating just how unpopular the United States has become since riding the post-9/11 wave of goodwill. Two years ago in Brazil, 56 percent viewed the US favourably, a year ago that was 52, now it's 34. In France it's fallen from 62 to 43. In Indonesia, 75 percent to 15 percent. And in Turkey, 52 to 15 . . .
Iraq is testing the extent of US power. Its military is stretched and America's ability to forge a democracy in the Middle East is being tested by Saddam Hussein loyalists and jihadists who are making Iraq a holy war. Andrew Bacevich: Al-Qaeda has not been destroyed, neither Osama bin Laden [who died in December 2001] or Saddam Hussein have been captured. So the success has been mixed I think, and any objective evaluation would say that. And there are some indications that we're just about up against the limits of what American power can do. John Shovelan: This week, President Bush acknowledged the limits in US power when he turned to the UN. 9 are million unemployed in the US, an increase of 6 million since the election of Bush-Cheney. 4 million high-paying tech jobs have been permanently lost. In Revelation 1:10 John looked back through time from the Day of the Lord to the Church Ages where he heard the Voice of Christ speaking from the seven Golden Lampstands. It clarified the condition of seven Churches in Asia Minor with which John was familiar and established them as a type for each of Seven Church Ages to come. When these were fulfilled, the sevenfold Spirit of God left the earth and Christ's ministry as Son of God and Mediator was fulfilled. After completing the heavenly transactions of Revelation 4 and 5 Christ returned in W_O_R_D form in the office Son of man by revelation of the Seven Seals through the mouth of His prophet (Acts 2:21; I Corinthians 13:10; Revelation 10:1-7). Throughout the Church Ages God sent seven angels or messengers: Paul, Irenaeus, Martin, Columba, Luther, Wesley and Branham, each under the preeminence to an eighth, the chief or Archangel Jesus Christ (Micah 4:1-5; Zechariah 4:6-10). These men were anointed with a measure of the Spirit to shine Light upon a portion of God's Word to quicken and guide the saints of that Age. Today Christ is enthroned in the heart of His end-time Bride who crowns Him King of kings when they receive and come under pre-eminence to the fullness of the Word (Revelation 5:8-14; 22:17-19). During the Church Ages when the Book was sealed with Seven Seals only PART-Word was revealed so the saints were in disagreement with the Bible. For instance, they made God three persons, and baptized in three Titles instead of the compound redemptive Name of the one Person of God. With such denials the Church Age saints could not crown Him King and they required a Mediator to intercede for their ignorance of the fullness of the Word. After the close of the Laodicean Church Age, John, representing Christ's end-time Bride, was summoned by the Voice of the Archangel: "Come up to heaven, and I will show you things that must happen after the Church Ages". Broadcasting the certain sound of the fullness of the Word, the clarion cry of this Voice was like a trumpet in comparison to the warbled uncertainty of PART-Word mixed with denominational reasoning and traditions. The Voice of the Archangel is now establishing our understanding on the certain foundation of the prophets and apostles by placing this end-time Message in Scripture from Genesis to Revelation. I Corinthians 3:11, "For no other foundation can anyone lay than that which is already laid, which is Jesus Christ" the Word. Revelation 4:2, "Immediately I was in the Spirit: and, behold, a throne stood in heaven, and upon the throne One sitting." The higher power of vision under the fullness of the Spirit forcibly expresses the instantaneous translation of the Seer, and you and I. "Immediately I was in the Spirit," caught up into the Day of the Lord to see things that are to be. The revelation of the Voice of the Archangel transports us into heaven itself by purging our soul of anything obstructing a clear view of the mind of Christ. This is another cleansing of the sanctuarynot the heavenly sanctuary where God is enthroned between the cherubimbut the sanctuary of our heart, that Christ may reign supreme over the kings of reasoning, memory, affection, imagination and conscience in this body prepared for Him, and manifest that we are the Sons of God. Faith is a clear understanding of the revealed Word of God and the evidence of righteousness. Having answered the "shout" of the Message which is our new birth we are raptured into heaven in the Spirit as individual members of Christ's end-time Bride by the still small "Voice of the Archangel" within, unlocking the mysteries of the Bible to us personally by the key of the Message. This newborn faith pulls down strong holds, casting down imaginations and everything that exalts itself against the knowledge of God, and brings every thought captive to the obedience of Christ that we may be one in understanding, even as He and the Father are one. This rapture commenced after Christ claimed the Book and opened the Seals in Revelation 5, descended to earth with the open Book according to Revelation 10:1 (I Thessalonians 4:16), and revealed them to us in Revelation 6 and 10:7 through the Message of Brother Branham. The vision of chapter four explains the heavenly transaction that took place after the close of the Laodicean Church Age before the Seals were opened. Brother Branham called Revelation 4, 5, and 10:1-6 "The Breach between the Church Ages and the Revelation of the Seven Seals". It is the "shout" of Brother Branham's Message announcing Christ's 'parousia' that woke the sleeping virgin, called us out from denominationalism and enthroned Christ in the heart of the wise. God in His wisdom and mercy took the lives of both 'Elijahs,' John the Baptist and William Branham, to minimize fleshly explanations and speculative debate over the meaning of their Messages and to cause the wise virgin to follow the Message by the authoritative Voice of the Archangel in their heart Spirit rather than the "letter" of the messenger. Now the Voice of from heaven that told John, "Seal up those things which the Seven Thunders uttered, and write them not until their mystery is revealed in the days of the voice of the seventh angel" instructs us "Seal not the sayings of the prophecy of this book [because Christ has opened the Seals and finished their mystery through the ministry of Brother Branham]: thus the time of judgment is at hand." Holding the open Book the Archangel Christ stands in judgment on Rome "the beast from the sea" and "the beast from the earth," her apostate (once) Protestant US image, and commands us to take possession of our Birthright, the open Book, become one with its mysteries, and "prophesy again concerning His final Message to the Gentiles" (I Thessalonians 4:16; Revelation 10:8-11). This will be "the Voice of the Archangel . . . prophesying again" through us, fulfilling Brother Branham's prophecy, "I'll ride this trail once more!" Christ is not perfecting His Bride in the unity of collective learning or church organization but in the unity of pristine faith through communion with the Voice of the Archangel enthroned in the heart of her individual members. This is a real 'inside job,' for "No man can say that Jesus is the Christ but by the revelation of the Holy Ghost" (I Corinthians 12:3; Revelation 2:17; 19:12). When the Pentecostal feast or Gentile dispensation is fulfilled, Satan will be cast down from heavenly places. After fifty-days the resurrection and translation of the Church will be past, Israel's two prophets will be anointed for their ministries with the Spirit that endued Moses and Elijah, and Satan will be incarnate in the pope. Christ's 'parousia' is the beginning of "the Son of man (not Son of God) coming in His Kingdom" (or Church) by the threefold Shout, Voice and Trump, culminating in the first resurrection and translation to the Wedding Supper of the Lamb and our 'parousia' to Israel prior to the return of the glorified saints of all Ages for a thousand years of peace (Matthew 16:28-17:8; I Thessalonians 4:14-17). On Mount Transfiguration, Peter, James and John represent the 144,000 elect Israelites recognizing Christ's 'parousia'our 'parousia' to them. In the vision, Moses represents the New Testament saints who will be resurrected and Elijah represents the end-time Bride who will be translated without death before we all return with the glorified Jesus for a thousand years of peace. In Daniel's Seventieth Week the 144,000 will turn away from the Law and the prophets to their glorified Messiah and as the Voice from heaven admonished: "Hear ye Him." This vision is also a type of our 'rapture' now taking place as we turn from denominational teaching to look full in His wonderful face. For the denominations know nothing of the present Truth and 'parousia'what Jesus is doing now. We must hear the Voice of the Archangel, take Him at His Word and trust in that, for the evidence of the new birth is righteousness. Romans 4:3, "Abraham believed God and it was accounted to him for righteousness." We will still be on earth when mercy has ended and God will try our faith in the manifestation of the sons of God as He tried Abraham and Isaac. As Abraham's true seed we will speak the Word and God will declare us righteous by performing what we said. Abraham and his barren wife waited twenty-five years for their promised son, and on the jubilee of the promise when Isaac was twenty-five (Josephus, Antiquities i. 13) God tried their faith. In the same year in which Egypt abolished human sacrifice, God told Abraham to sacrifice his only son. This child of the Spirit submitted to His father's will, bearing the wood and allowing himself to be bound for his own intended sacrifice (Hebrews 10:1-9). Abraham trusted God would somehow provide for Himself a sacrifice, having promised that through Isaac he would become father of the Gentiles. God did provide a substitute in the form of "a ram caught in a thicket by his horns" as He provided a substitute for us in the form of a Man crowned with thorns. Abraham received Isaac as from the dead whereby his faith was made perfect (Hebrews 11:19; James 2:21-23). These Old Testament accounts were recorded as shadows and types of good things to come and evidence to strengthen us in the assurance God keeps His promises. As soon as Abraham obeyed without reserve, God revealed His hand. Isaac was a type of Christ who was resurrected by His own faith in God's Word (Psalm 16:10; John 2:19). And the end-time Bride will be translated as from the dead by her faith and trust in His Word. How did the ram come to be on top of barren Mount Calvary where there was no water or pasture and the chance of predators? Abraham rested solely in God who honoured the promise of His Word. How are we going to survive the coming persecution and manifest the Sons of God? How will we change in the atoms to escape the wrath that is to come? How was the Capstone placed on the pyramid of Christ's Church? There is absolutely nothing that we can do but trust and obey, being persuaded that He is able to keep that which we have committed unto Him against that day. Soon the hour of trial will be upon the world. As God had to deliver Isaac in order to fulfill His promise to Abraham, He must now deliver us in order to fulfill His promise of a Bride to Abraham's Seed. We are Abraham's seed by the baptism with the Holy Ghost, and without us the Church Age saints cannot be glorified. "This Age is fast closing. As it does those tares will be bound together, and as a three-fold cord is not easily broken, they will have a tremendous three-fold strength of political, physical, and spiritual (satanical) power, and they will seek to destroy the Bride of Christ. She will suffer, but she will endure. Fear not those things that are coming upon the earth, for He "Who loved His own, loves them unto the end" (John 13:1; An Exposition of the Seven Church Ages, p. 355:2). Christ "stands outside (the denominational churches) calling to His own who follow Him by obedience to the Word. After a short and powerful demonstration of the Spirit this little hunted and persecuted group will go to be with Jesus" (ibid, p. 361:1). "When the wheat and the tares are harvested, which from the first Age until now have grown side by side, what Nicaea set out to accomplish finally comes to pass. Then with all the might of organization the false church turns from any vestige of truth and with political might reinforces herself with state backing and sets out to eradicate forever the true believer. But just when she is about to accomplish her cowardly plot the wheat is gathered into the garner. No longer will the wheat and tares grow side by side. No longer will the tares receive of the blessing of God because of the presence of the wheat, for the wheat will be gone and the wrath of God will be poured out in the Sixth Seal which will end in the utter destruction of the wicked (ibid, p.362:3). Revelation 4:2-3, "Immediately I was in the Spirit: and, behold, a throne stood in heaven, and upon the throne One sitting. He was in appearance like jasper and sardine stone: and there was a rainbow around the throne, in appearance like an emerald". This One seated on the throne is not the Man from Galilee but God, the great Holy Spirit who begat Him. What John sees is Light, the glorious appearance of the Logos or Glory that came out from God. Jasper is like water, said Bishop Victorinus (who was martyred around AD303 in the Diocletian persecution). It is the last of the gems in the high priest's breastplate (Exodus 28:20) but the first in New Jerusalem's foundations (where it is therefore regarded as the chief or most precious stone and stands for the tribe of Reuben, Jacob's first born). It represents watery crystalline brightness and is a symbol of purity. This is not the ordinary jasper but the diamond (Revelation 21:11). Its luster, together with that of the sardius stone, characterizes the appearance of God Himself upon His throne, and as the most precious of all stones expresses the glory of God which lightens His City. The sardius stone (carnelian) was the first gem in the breastplate of the high priest and stood for Benjamin. It looks like fire and represents God's fiery wrath (Ezekiel 1:4; 8:2; Daniel 7:9). As this is a throne of judgment these stones seem to represent God's Majesty and justice in judgmentsthat of the Flood and that of the fire of Sodom in the last dayand Mercy and Glory to His elect in the fullness of His Word. Ezekiel 1:26-26, "High in the sky above the cherubim was what looked like a throne made of beautiful blue sapphires upon which sat the likeness of a Man. From His waist upward He seemed to be the color of amber, dazzling like fire, and from His waist down He appeared to be entirely aflame, and there was a glowing halo like a rainbow all around Him. Such was the appearance of the likeness of the glory of the Lord. And when I saw It, I fell upon my face, and heard the Voice of Someone speaking to me". Both Ezekiel and John saw Him enthroned and encircled by a rainbow, signifying His covenant with the earth. As the glory of God is Christ, the glory of Christ is His Church; we walk in the Light as He is in the Light, and in Him is no darkness at all (I John 1:5-7). God is Light so His true Church was begotten of seven pure colors reflected through the Church Ages gathered into the amber Logos surrounding the throne that signifies Christ in unity with His Church in the end-time (John 17:9, 23-26; Ephesians 1:10; 4:13). That Light surrounding the Throne is the glorious reflection of the Logos from which essence God is creating His elect; it contains us, created from the Holy Spirit taken from His side on Calvary. When we are shown this vision in Revelation chapter four, the day of redemption is over. The seven fractions of God's Covenant of Light with the earth have been gathered back into Himself and appear in their original translucent yellowish green or amber color. Green is the predominant color of the natural rainbow and the colour of the promise of Life, for God promised He would never again destroy the world by water. Yet it is also a silent memento of the coming judgment (Genesis 9:13-16; II Peter 3:7). After Christ claims the Book of Redemption in chapter five, His inheritance from God, this horizontal rainbow around the Great White throne is transformed into the theophanies or angels of our glorified appearance. Until the Seals were broken and the mystery of God revealed we could not know who were the elect in each Age, or by what portion of God's Word they were redeemed. We only knew they were attributes of the Logos, and in Revelation 4 that was what we saw surrounding the Throne of God. When the Seventh Seal was broken in 1963 all those theophanies descended with Christ to receive their glorified bodies in the soon-coming first resurrection (I Thessalonians 4:14-17; Jude 14-16; Revelation 10:1). Soon we who are alive and remain will be glorified and physically caught up together with them for the Wedding Supper with the Lamb in the sky and be forever with Him. Genesis 22:15-18, "The Angel of the Lord called to Abraham a second time out of heaven, and said, By Myself have I sworn, for you have not withheld your son, your only sonblessing I will bless you, and multiplying I will multiply your seed as the stars of heaven, and as the sand which is on the seashore; and you Seed [Heir] shall possess the gate of His enemies; and in Jesus Christ shall all the nations of the earth [us Gentiles] be blessed; because you [Abraham] have obeyed My Voice," setting a type for the death and resurrection of your Kinsman Redeemer. These words speak not of natural Israel but the Israel of God: Spiritual Israel, the elect Church whose nativity was among believing children of Israel, but since their apostate tribesmen organized the Roman Catholic false church in the Pergamean Age, her increase "numerous as the stars of heaven," has come from among us Gentiles. These "stars of heaven" are portrayed in the visions of Revelation 4, 5, 19 and 21, transformed from the Logos by the spoken Word to redeemed souls and re-gathered back into the Logos; then glorified and revealed to the 144,000 Israelites in their 'parousia' as "the armies which were in heaven following Christ on white horses, clothed in fine linen, white and clean;" finally returning physically to earth for the Millennium. "The gate of His enemies" does not refer to Britain's former possession of the Suez Canal, or United States' one-time ownership of the Panama Canal as British Israel cults speculate, but to Jesus Christ putting all of His enemies, including death, beneath His feet (Matthew 16:18; I Corinthians 15:25-26). As a nation the Israelites have been apostate for 2,000 years. Ever since the Babylonian captivity they've been ruled by non-Semitic, anti-Semitic self-styled "Jews," who from that day to this have nullified Moses and the prophets with the Babylonian Talmud which Jesus said, "makes the Word of God of no effect." According to Moses (Genesis 3:15; Deuteronomy 32:21), Isaac (Genesis 27:39-40), Isaiah 49:6-7; Daniel 9:27; Malachi 1:1-4 and Jesus (Luke 21:24), Jerusalem and the descendants of Abraham, Isaac and Jacob will be ruled until the consummation and destruction of all life on earth by Serpent's seed and Gentiles who style themselves "Jews". In face of this, only a blind man would regard Edomite Jews "against whom the Lord has indignation forever" as 'God's Chosen People.' They never had any part in God's promises but those recorded in Genesis 4:9-12, 9:25, Obadiah, and summarized in Malachi 4:3 and Romans 9:13. Those who hold such unscriptural superstitions are without comprehension of the written Word, and without the Holy Spirit. Such ignorant "fear of the Jews" is a statement betraying the fact that Christendom has joined Israel in apostasy, is naked of the blood, bankrupt of the Spirit, and knows not that it is ripe for the judgments of God (Revelation 3:17-20). Paul's exposition of Genesis 22 in Galatians 3:5-29 and Hebrews 6:13-20 proves Jesus Christ is Abraham's Seed, and explains how those of the faith are Abraham's children by the Baptism of the Holy Ghost and joint heirs with Jesus Christ according to the promise. Natural Israel rejected the promise of Abraham 3,500 years ago when they came under the curse of the Law and had long rejected even Moses' covenant when Jesus Messiah, the Seed of Abraham, visited His own. When Israel slew Messiah the blessing of Abraham passed from that nation to we Gentiles via a tiny election of individual Israelites (Isaiah 11:10; Malachi 1:11; Acts 13:46). God swore this Abrahamic covenant by Himself because He could find no one greater by whom to swear. Abraham's seed are not Hebrews, the multiplication was among us Gentiles who are Abraham's seed by the new birth. Abraham means "Father of the Gentiles." God's Chosen People is the Bride of Christ, the people of love, not "Jews" who boast of themselves as people of hate. Read your Bible and the Talmud, or publications by their rabbis. In Genesis 3:15, God set enmity between those people and the seed of Adam, the seed of Abraham, and the Seed of God. Brother Branham said if a person cannot see this, just walk away from them, you know the election is off. Yet blind leaders of the blind within the circle of this Message deny the Bible which identifies the true Christians as God's Chosen People. Christians are the Israel of God because by grace through faith we believe and inherited the promises of God by the prophets Israel rejected. Because we are God's Chosen People, we are called His elect. Revelation 4:4-7, "And around the (Great White) throne were four and twenty thrones: and on the thrones twenty-four elders sitting, clothed in white robes; and on their heads golden crowns. And from the throne came lightnings and thunderings and voices: and seven lamps of fire were burning before the throne, which are the seven Spirits of God, and before the throne as it were a glassy sea like unto crystal: and in the midst of the four sides of the throne, four living beings full of eyes in front and back. And the first living creature like a lion, and the second living creature like a calf, and the third living creature had a face like a man and the fourth living creature like a flying eagle". Daniel (7:9-10) saw the same vision of the White Throne judgment five hundred years before the elders were redeemed in Christ on Calvary. Consequently their twenty-four thrones were empty. "I watched the vision until thrones were put in place, and the Ancient of days was seated; His clothing was white as snow, and His hair like whitest wool: his fiery throne was borne on flaming wheels. A river of fire came forth from before Him: Millions ministered to Him [the Bride of all Ages], and hundreds of millions [the "saved" whose names remained on the Book of Life stood before Him waiting the judgment that will grant them into eternal Life],Court was in session and the books were opened". Daniel did not see any elders, just their empty royal thrones. Two thousand five hundred years later when John, Christ's end-time Bride, is caught up into the Day of the Lord and sees this vision, the thrones are occupied by the twelve patriarchs and twelve Disciples. The scene in these visions of Daniel and John is a preview of the White Throne Judgment that follows the general resurrection after the Millenniumone thousand years into the Day of the Lord. Actually the world has been under judgment since the revelation of the Seven Seals which finished the mystery of God and delivered the fullness of the Word as Judge (John 5:27). This explains why in most of our ministry and personal witness today, we are absolutely preaching to the lost. Revelation 22:10-11, "Brother Branham told me, Seal not the sayings of the prophecy of this Book: for the time [of the final judgment] is at hand. He that is unjust, let him be unjust still: and he who is filthy, let him be filthy still: and he that is righteous, let him be righteous still: and he that is holy, let him be holy still". Since we now have the fullness of the Word this is a serious hour in which ignorance is no excuse. He who has tasted and rejected this end-time Message has rejected Christ, for this Message is fullness of the Word. Like Esau, he has come to a place of no more repentance. His name is removed from the Book of Life, and he is lost (Matthew 12:32; John 3:18; Hebrews 6:4-8). Once Messiah had been murdered by His own kindred there was no more mercy available to the Israel nation until the time of "Jacob's trouble." And here is where the "Jews," a pagan race of largely Hittite stock initially from Lower Mongolia, were mortally smitten by their cupidity, stupidity, cowardice, avarice and ignorant pride when they converted to Talmudic Judaism overnight in AD740 as a cunning political device of their chagan, Bulan. Those who are Hittites are not of Adam's race and were never on the Book of Life. While "Jews" who are Gentiles impersonating the Hebrew Israelites, have turned their backs on their day of redemption which is under the Gentile dispensation. Having chosen the path of the Talmud and blasphemy for political advantage, they became partakers in Israel's sin, and must partake of her plagues. When Jesus was crucified, only His body was buried. His soul went to the realms of the departed where He continued preaching as a witness against those whose names were already removed from the Book of Life and could never be saved, and to vindicate the just who had received the Words of God's prophets. Since the fullness of the Word has been placed and the Mercy Seat is now a Judgment Seat, most of today's Christian ministry is to those who are eternally lost, being mortally smitten by their cupidity, stupidity, cowardice, avarice and ignorant pride. When Laodicea rejected its Message it put Christ to an open shame outside the churches that bear His Name. The fullness of the Word, "prophesied again to many peoples, and nations, and tongues, and kings" is smiting the spiritually dead unbelievers with the sharp sword of God's Word and plucking the wise and foolish virgin as a brand from the fire. Daniel, like John, was caught up in the Spirit into Lord's Day, and when he looked behind himself into man's day, he saw the development of four successive Gentile empires up to the end of the Gentile dispensation and Satan's incarnation in the Pope (Daniel 7:1-8). The judgment was set, and court was potentially in session because mercy was over: "He that is unjust, let him be unjust still: and he who is filthy, let him be filthy still: and he that is righteous, let him be righteous still: and he that is holy, let him be holy still". Before the last pope is cast into the lake of Fire with his end-time followers, and even before Daniel's Seventieth Week has begun, every soul will have made their last decision for God and His Word and sealed their own destiny (Daniel 7:11; Revelation 19:20). The fate of the non-elect is sealed before the Great White Throne Judgment, because their names were removed from the Book of Life one thousand years beforehand. Jesus confirms this, for when the hearing actually takes place, "whosoever was not found written in the Book of Life was cast into the lake of Fire" (Revelation 13:8; 17:8; 20:15; Daniel 7:12). The visions of Daniel 7:9-10; Revelation 4:3-6 and Revelation 5:6-14 show three stages in the development of the same vision. So the revelation of God's unchanging Word is progressive. Whereas the elders were unknown in Daniel 7, in Revelation 4 they have all been named as they were redeemed in Christ on Calvary and identified in the Gospels and Book of Acts. However the identity of the rest of the Body must remain a mystery until after the Lamb takes the Book and opens the Seals in Revelation 5. Revelation 20:11-15, "And I saw a Great White Throne, and Him who sat on it, from whose face the earth and the heaven fled away, but they found no place to hide. I saw the dead, small and great, stand before God; and the books [of lost sinners] were opened: and another Book was opened, which is the Book of Life [containing the names of the sanctified ones who had not received the Holy Ghost]: and the dead were judged out of those things which were written in the books, each according to their deeds. The oceans surrendered the bodies buried in them; and death and the grave gave up their dead. Each was judged according to his deeds. Then death and disembodied existence were cast into the lake of Fire. This is the second death [the death of the soul, for the correction of those who believe 'soul replacement' theory]. And whosoever was not found recorded in the Book of Life, was cast into the lake of Fire". "The ecumenical move will bind the tare churches together, for the tares must be bound first, and though their end is burning, they are not burned at their binding but are reserved to a later date, which is at the end of the thousand years, or the second resurrection. [You see, the first death is that of the bodyEd]! But once the tares are bound the rapture [i.e. translation] can take place and does so at some time between the binding and the revelation of antichrist. Then will come the day when all stand together as seen in Daniel. The King will be there with His Bride and in front of them will be the multitudes that are to be judged. Yes. All are there. All the books are opened. A final disposition of all is made. The harvest is indeed over. The books once opened are closed (William Branham, An Exposition of the Seven Church Ages, 285:1). God never changes His ways. When Israel murmured against God, He assembled the nation before Mount Sinai where they passed from Abraham's unconditional covenant of grace to Moses' conditional covenant of condemnation. The people were commanded to sanctify themselves and remain at the foot of the mountain within the boundaries of the court of the congregation. And if man or beast touched the mount he must be put to death, as later, guards would slay any trespass beyond the outer court of the temple (Exodus 19:10-13). When as the Lord spoke His Commandments in an audible voice "all the people saw the thunderings, and the lightnings, and the noise of the trumpet, and the mountain smoking: and when the people saw it, they removed, and stood afar off. And they said unto Moses, You speak with us, and we will hear: but let not God speak with us, lest we die" (Exodus 20:18-19). This perfectly typed what we saw in Revelation 4:1-5 after the close of the Laodicean Church Age when the Mercy Seat became a Judgment Seat. After the people had entered a covenant of blood with the Lord, Moses and Aaron the priest, his sons Nadab and Abihu, and seventy of the elders of Israel (typing the Gentile nations) went up the mountain where they saw the Lord, high and lifted up above a sky of sapphire blue. And they ate and drank in this holy place as the priests would eat the meat offering and unleavened bread, sin, trespass offering and showbread and drink the drink offerings in the sanctuary before the Presence of the throne in the holy of holies in the tabernacle and the temple (Exodus 24:1,9-11). Finally, the Lord called Moses to come up with Him into the mountain where He would communicate the Law and give him two tables of stone on which He would write the Commandments (Exodus 24:12-18). This types the holy of holies where the high priest entered once a year into the Presence of the Lord. Moses structured the tabernacle of meeting after the pattern he had seen in the mount, and David designed the temple Solomon built after the same pattern. The court of Israel was an outer court before and surrounding the actual holy place and holy of holies and which contained the laver in which the sacrifice was washed before it was presented on the brazen altar of sacrifice. Within the sanctuary of the Holy Place was the table of showbread representing the elect 144,000 Israelites, the seven golden lampstands signifying the Gentile Church, and the golden altar of incense where the priests interceded before the Holy of Holies. Inside the Holy of Holies was the Ark of the Covenant with its Mercy Seat overshadowed by two Cherubim. Above the Mercy Seat and between the Cherubim the Glory of the Lord appeared to the high priest on the Day of Atonement. The Ark contained the second tablets of the Law, Aaron's rod that budded, and a golden pot containing manna. Since the day of Pentecost the Lord has tabernacled in the members of the Bride. I Corinthians 3:16, "Don't you know that you are the temple of God, and that the Spirit of God dwells in you?" We enter into His Presence through faith in who Jesus is, and what He accomplished for us by His vicarious death and resurrection. And being justified by His grace through our faith, we repent of our past unbelief and receive Scriptural water baptism by immersion in the Name of the Lord Jesus Christ for the remission of those sins. Justification is equivalent to the qualification for entering upon the outer court of the temple. The sacrifice we bring is faith in the Lamb of God that takes away the sin of the world. In the present temple of God, the outer court is our body. We enter the Holy Place by Scriptural sanctification, cleaning up our lives by aligning our thoughts, words and deeds with His revealed Word whereby every correction is a further step of grace through faith to holiness. We walk in the Light as He reveals it to us until, like the pyramid, there no shadow of darkness around us. Our holy place is our mind; we must bring it to a state of holiness to control our body and direct our words and actions. Finally, the baptism with Holy Spirit which is the new birth wherein the old worldly nature of this world that once was the husband of our soul is dead to us, and the Spirit unites our soul with our espoused Husband, the revealed Word of the hour. Christ has taken residence and lordship over our soul which is now the equivalent of the holy of holies. Nothing unclean or profane can live in that place, for He is holy and will not share His Glory with another. We see these stages of grace represented in the progressive development of the visions of the Throne of Mercy and Judgment in Daniel 7, and Revelation 4 and 5, which reach their acme of perfection in Revelation 21 where the whole Kingdom of God's creation is justified, manifest as the New Jerusalem anointed by the Shekinah and reigning under a renewed heaven over a renewed and holy earth. The thousand thousands are the Bride of Christ of all Ages who minister to the King as His Queen in His Throne or Judgment Seat in the Holy of Holies which translates into the Palace. They are approached through four cherubim standing in the Holy Place on either side and in the middle of each side of the throne and signify the four Gospels and their scribes: Matthew (Lion), Mark (Calf), Luke (Man), and John (Flying Eagle). They type the elders who will judge in the gates to the City and receive tithe from the "saved." Before them in the outer court stand the righteous who did not receive the baptism with the Holy Ghost, awaiting judgment that they may enter in to eternal Life. "Without are dogs, and sorcerers, and whoremongers, and murderers, and idolaters, and whosoever loves and practices lying" (Revelation 22:15). Their names have already been removed from the Book of Life, and their destiny is annihilation in the lake of Fire. At the Great White Throne judgment these three companies will be characterized by the Lamb's Book of Life representing election and new birth in the saints of both Testaments who enter and constitute the holy of holies or New Jerusalem. The Book of Life signifies the various classes of those who will stand before the King and Queen in the judgment. Jesus likened this sanctified group to "sheep" They are the subjects of His Kingdom who will dwell around the circumference of the new earth. Finally, the Books of the sinners who are far more numerous and comprise many sturdy volumes. Jesus likened these to "goatscursed into everlasting Fire, prepared for the Devil and his angels." (Matthew 25:31-32, 41; 7:13). Homework: Please review the radio transcript, Revelation Chapter Four 2/3.